​Choose to relax, and de-stress while staying with us. 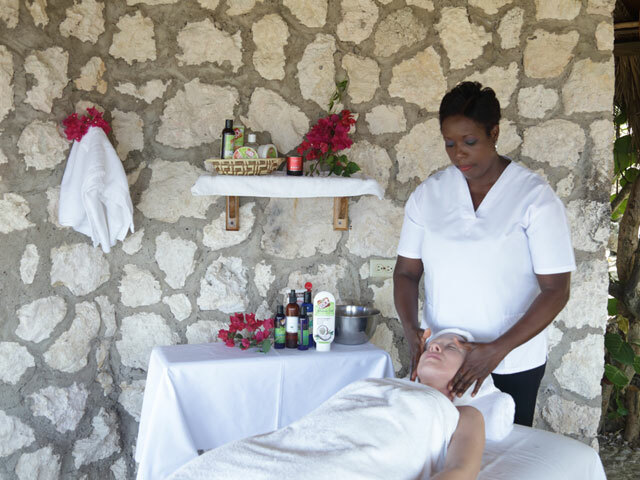 Our spa treatments in the Massage Hut will leave you centered and rejuvenated. Or join a Yoga sessions for all levels in the SeaSong Hut, to the sound of soothing ocean breezes. Massage services are offered in our new massage hut on the far north side of the property. Gentle ocean breezes glide across your body as our trained therapists help you to de-stress and truly relax into your vacation. Salon treatments such as manicures, pedicures, facials and hair styling may be arranged in the privacy of your cottage. Tensing Pen is the ideal place to relax, unwind and rejuvenate. Daily yoga practice is available in the open-air Seasong Hut. Our instructor, Fanette Johnson teaches the IYENGAR style of yoga, which emphasizes alignment, balance and breathing. She teaches an all-level class suitable for beginners, intermediate and advanced students, so anyone can take part. Fanette was born in France and has spent half her life in Jamaica. She has taught yoga in Paris, New York and Negril and has been teaching for twenty-five years. Private yoga classes can be arranged by our Guest Service team, upon request.